This final gift guide is dedicated to beauty. Beauty gifts offer up many possibilities since there are so many categories from skincare to makeup to high tech gadgets with prices that range from the affordable to the luxe. As with all my other gift guides, I'm including a few picks which happen to be personal favorites as well as a few that might be on my wish list as well. 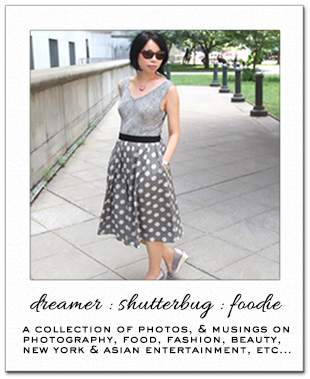 If you're looking for a little treat for yourself, be sure to enter my latest giveaway. I've partnered with Formulate and the prize is a fully customized shampoo and conditioner set. Check it out here. This fragrance shines with iridescent pink and silver sparkles that imparts skin with a dewy, shimmering glow and a warm and spicy scent with hints of caramel and vanilla. The moisturizing mist contains three percent fragrance oil which is similar to an eau de toilette. Billed as the "first smart mask treatment," this device provides 90-second facial treatments that feature enhanced hyper-infusion technology. The UFO integrates thermo-therapy and cryo-therapy to push mask essence into skin’s surface and lock in moisture while reducing the appearance of pores. T-sonic pulsations gently massage mask essence into the skin, while full spectrum LED light therapy completely rejuvenates skin. I have one. I really like it and I need to write about it. This lipstick is housed in a stunning case designed to look like a bouquet with a white opal Swarovski accent. Four flowers bloom atop the cover which contains a secret mirror. The creamy lipstick applies smoothly with a soft luxurious luster and soft and moist finish. This is easily the most beautiful lipstick I own. It has a lovely lightweight texture and a sheer hydrating color wears for comfortably for hours. Packed with flower extracts and pearl, this primer meets moisturizer which can be used under makeup or on it's own, works like a filter to illuminate the complexion for the look of glowing, picture perfect skin. This 7 piece skincare kit contains some of Dr. Jart+’s most popular and transformative products. It includes the Cicapair Tiger Grass Color Correcting Treatment SPF 30 which I now swear by in place of foundation. From Japan's best selling beauty brand Decorté, this soft-crème blush features highly translucent pearls with coated pigment technology that creates a radiant, lit from within effect. I'm smitten and this is the only blush I reach for since it has entered my life. This bestselling highlighter palette is described by Charlotte Tilbury as a "a lustrous library of light for the face and body,"
A must read for any beauty lover who also appreciates beauty history, Pretty Iconic takes a compelling deep dive into over 200 iconic products that are among the best and most influential in the beauty world. I'm reading it now myself. This breakthrough LED device lets you use the power of medical grade light intensity at home to stimulate collagen and elastin to strengthen the cellular structure of your skin to reduce fine lines and wrinkles for smoother and firmer skin. This best selling serum infused with peach extract, niacinamide, East Asian mountain yam, madecassoside, peptides, and hyaluronic acid which works to hydrate, calm, brighten and firm skin does the heavy lifting to create the look of glass skin. I have a bottle in my refrigerator which I haven't opened yet. Will report back when I have tried it. I love this cream which has been touted as a a natural La Mer. It's only $10 and it's a wonderful occlusive moisturizer that I use on my face as well as anywhere else on my body that needs help with hydration. This collection from the popular clean beauty brand features a set of travel size minis which deliver unparalleled results when used together and are compatible with all skin types. This popular skincare trio is packaged in a pretty, limited edition, pink jelly bag that can easily be re-used. I have used all three and the Watermelon Glow Sleeping Mask is a particular favorite. This compact, folding dryer has all the power and features of a professional dryer. The lightweight design and dual voltage switch makes it a perfect travel companion. Infused with a unique combination of precious oils, goji berry, and amber extract, this rich elixir works to rejuvenate and repair dull, dry, damaged, or color-treated hair with the highest level of protection against UV, heat-styling, and color fade. I use this and it makes my hair so shiny and manageable. This is a dry shampoo that will do more than just clean and refresh your hair. It works to absorb excess oil, increase volume, and add definition. I've tried many dry shampoos and this is by far one of the best. I love how it's clear, can be used for texture and the clean, refreshing scent means my husband can use it too. Perfect for a night of pampering, this collection of masks features a face mask for pretty much every skin concern, plus a lip and eye mask. The After Party Brightening Bio-Cellulose Second Skin Face Mask is so good! This set which includes six of Oskia's best and most popular products packed in a patent travel bag is a lovely introduction to the brand. It includes the Renaissance Cleansing Gel, an illuminating vitamin and enzyme gel-to-oil cleanser, Super 16 is a powerful pro-collagen serum that blends 16 super-nutrients and bio-actives to target multiple concerns as well as the celebrated Renaissance Mask, a brightening and resurfacing complex that imparts an amazing glow. These are three of my best beauty discoveries of the year. Formulated with a soothing and moisture rich blend of organic camellia and calendula oils and a hint of peppermint, this eco-luxe lip balm nourishes, protects and hydrates lips without the typical lip balm hangover. This nail polish housed in stunning gold topped bottle, features an eight-free formula and a beautiful range of shades. I own two of them and can attest to the pigmentation, smooth coverage and long lasting, high-shine finish. My shade of choice is Peaceful Paranoia. This luxurious hand cream not hydrates, softens and brightens, it contains may rose wax which leaves a moisturizing, protective veil on skin for lasting benefits. It may seem a little extra but I know a few people who own this hand cream say it's worth it. I have tried it and it is silky, quick absorbing and effective without any greasiness. This gorgeous set of five natural, satin-finish lipsticks in a range of fashion forward shades looks like it was made for gifting. Great brand and selection to choose and give for the holiday to female friends or family. Love DE products. Enjoy your weekend. 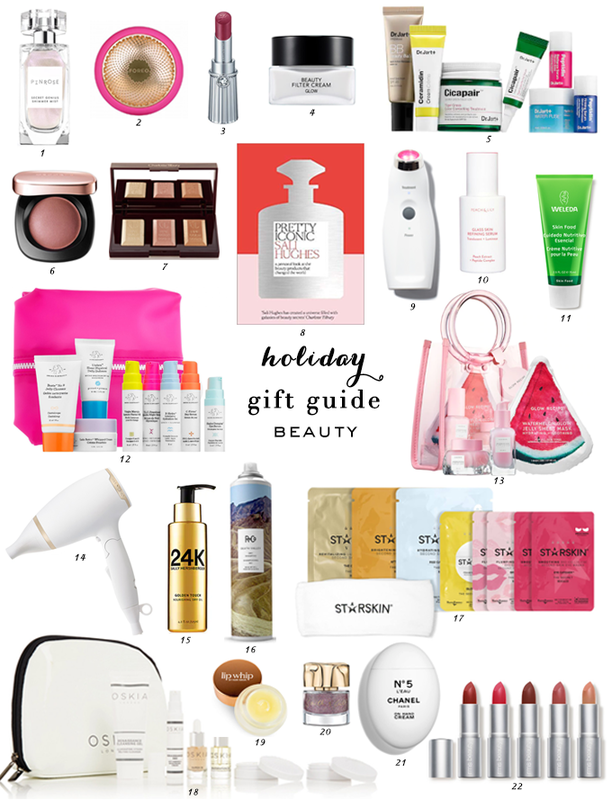 This is a great beauty gift guide. Not only do the products seem promising, but the packaging of all of them is gorgeous which is always a plus when it comes to gifts. I do like the Wild with Desire lipstick set, it would make for such a cool gift. Wow! You made a great list. I love seeing beauty guides for the holidays! These make great gifts and those lipsticks are so pretty! So many lovely products here... great selection! Such a great roundup of products! I'm actually curious about the R+Co dry shampoo now, as I've yet to find one that I really like, so thank you for sharing!